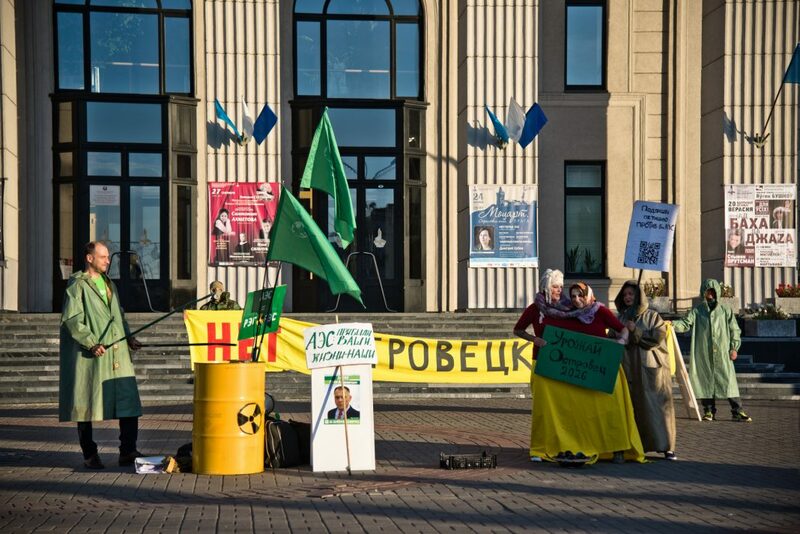 "No Nuclear Power Plant in Ostrovets", Protest by the Belarusian Green Party in Minsk against the plant in Belarus. The current Eastern Partnership Summit at the end of November in Brussels witnessed a modest but brave action by the protestors in front of the EU Parliament pleading to stop the construction of Ostrovets nuclear power plant in the authoritarian Belarus at less than 50 km away from the EU border. The construction of the Ostrovets Nuclear Power Plant (ONPP) started in 2009 and to date poses serious concerns of compliancy with international safety and environmental standards. Since the beginning of works, there were at least several incidents at the construction site. Belarus has not respected the UN’s Espoo and Aarhus conventions on international oversight and impact assessments, subsequently also refusing to conduct Ostrovets stress tests in line with a European Commission agreement and not letting the EU officials to visit the site. Moreover, nuclear plants these days, after so many accidents, ought to be built much further away from population centers, while ONPP is only 44 km away from Vilnius, a European capital, populated to more than half a million people. In a region where the devastating human consequences of the Chernobyl disaster three decades ago are still vivid, Belarus’ step to build a Russian-financed power station on its border with the EU has become a source of deep concern. ONPP is being designed and built by Rosatom, Russia’s state-owned nuclear power monopoly company and is being financed by a $10 billion credits from Moscow. Unfortunately, to date the anxiety about the Ostrovets plant is mainly growing in geographical neighbours – Poland and Lithuania. LT government considers it a threat to national security, public health and the environment. The EU remains rather blunt and lacks accumulated action towards the potential of hazardous risk posed on all territorial Europe, as distance means nothing if the worst scenario happens. Lithuania, as a condition of its EU entry, closed down the Ignalina NPP because it had unsafe, Chernobyl-type reactors, therefore at least to expect would be solidarity from the EU to ensure the energy security nowadays. Being authoritarian or not, Belarus is a sovereign country and there are no legal means to ban construction of ONPP on its territory. Nonetheless, various legal means are available to ensure a higher level of security of ONPP. The consultation measures currently pursued by Lithuania under Aarhus and ESPOO Conventions will bring no result as they cannot be enforced. The pressure could be strengthened by initiating judicial or arbitral proceedings (but Belarus has to give its consent as to jurisdiction, what is hardly expected). Article 215 entrenches legal framework for adopting restrictive measures in order to prevent and combat terrorism and related activities. Article 75 entrenches legal framework for adopting restrictive measures in order to implement the goals of a common foreign and security policy. The perils of ONPP construction fit within this legal framework in the way of the insufficient security against terrorism threat (the sarcophagus is not designed to protect ONPP against terrorist attack from air) and insufficient nuclear security in the EU on the whole. However, important to mention, there was already a precedent under the EU law: sanctions adopted over the nuclear program in the case of Iran, resulting in a wide range of autonomous economic and financial bans. Importantly, sanctions could have an adverse financial effect on the contractor and its interests in other EU projects. The sanction regime could be applied until ONPP raises the level of its security to match it with EU requirements and nuclear safety in case of terrorism (9/11-style attack). This obviously needs firm EU leadership and will to strengthen EU’s energy security in order to balance the regional threats and ensure the security of the European citizens. Ramunas Petravicius is Partner at Ellex Valiunas law firm.